As a glass artist I know how beautiful glass can be but also how it can destroy the beauty of a natural landscape when it has been discarded as trash or used for target practice. Being chosen as an Artist-In Residence at The Red Rock Canyon National Conservation Area (RRCNCA), to rely this message, I utilized the broken glass trash I collected in the RRCNCA and repurposed it into this mosaic glass collage. At the RRCNCA Visitor Center, I designed & created a series of four 8″ x 8″ mosaic tiles of the Native American Symbols; the arrow pointing to the right (protection), the big mountain (abundance), the sun’s rays (constancy) and the cactus (sign of the desert). I arranged these in a 8″ x 32″ row to symbolize “Protection of the Abundance and Constancy of the Desert”. The weathered poplar wood for the frame was donated by Kevin Fults, of Woodstock Architectural Products for this project. It will be shown along with several other glass pieces I created at the Visitor Center in July 2018 and donated to the Southern Nevada Conservancy. 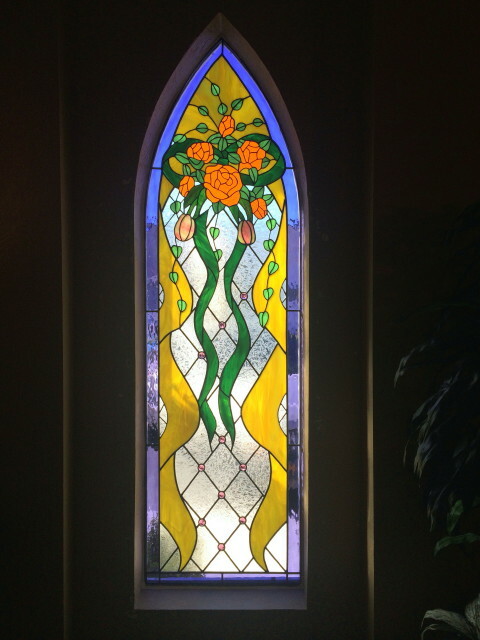 I was commissioned by “A Special Memory Wedding Chapel” to design & create a stained glass panel to replace one of their three stained glass chapel windows that was severely damaged and removed. 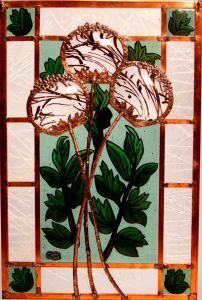 I wanted the new 76 1/2” x 22 3/8” stained glass window panel to blend with the other two so it would appear that nothing had ever happened. 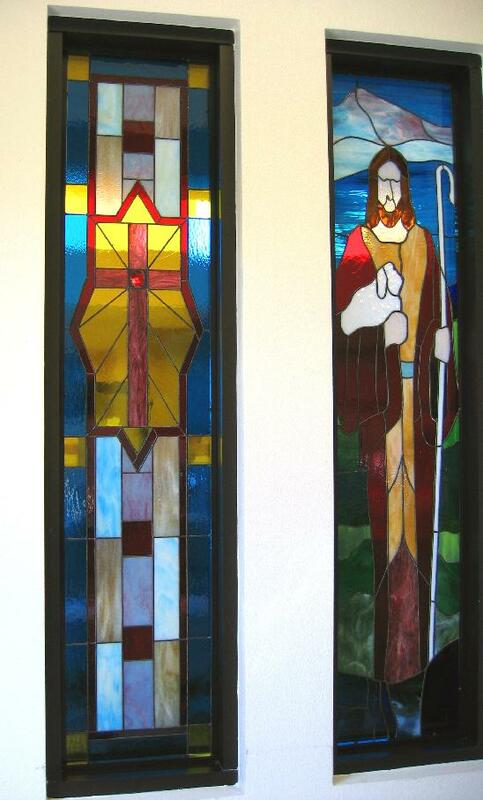 The owners were thrilled and relayed that they liked it even better than the one replaced and loved the colors I chose to create the new stained glass replacement panel! The Center for Spiritual Living has been in exsistence for fifty years. 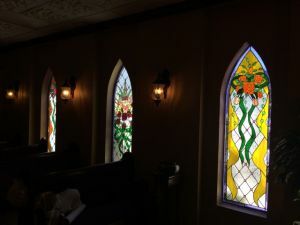 I had the opportunity to donate my time to design and recreate the stained glass windows of their sanctuary as a part of the overall improvement of the church. My objective was to represent the church now and carry it into the future… for at least another fifty years! The Center Panel consists of four panels over six feet each, resulting in completed panel of over 24 feet high. 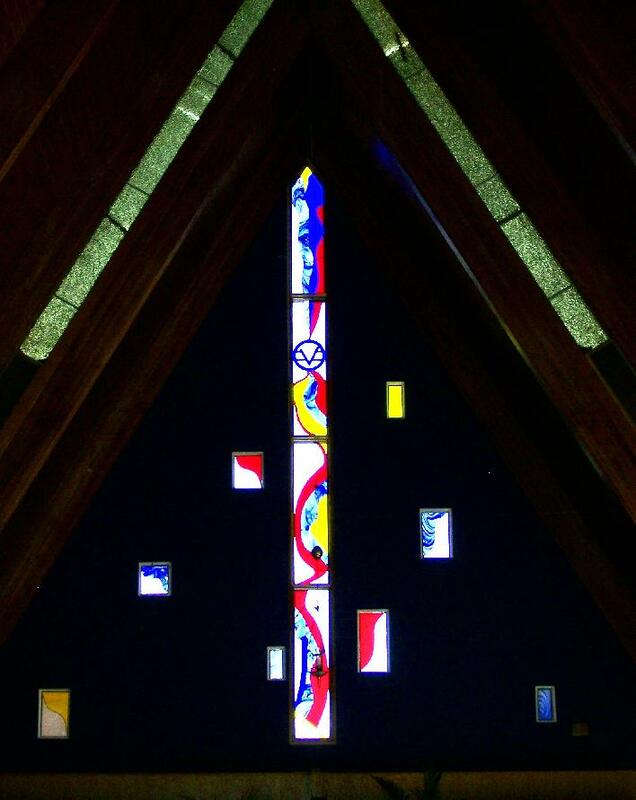 The name of these stained glass windows is “Spiritual Evolvement”. 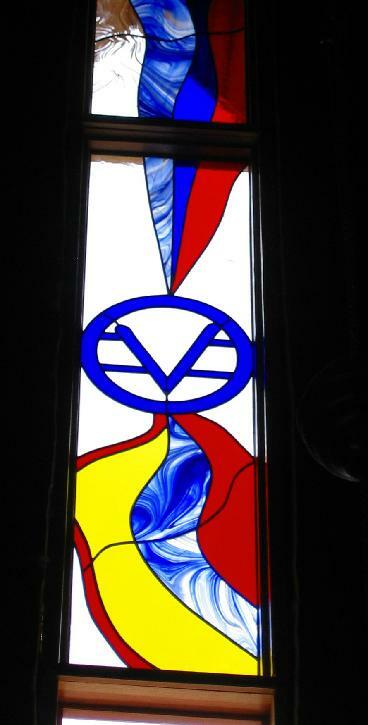 This 29 ¼” x 19 ¼” panel is a one-of-a-kind collaboration of stained & Vitri-Fusáille glass, designed & created by a glass artist, Cathy Claycomb & myself, bringing two different techniques into one vision from different parts of the country! This piece recently received “First Place” & “People’s Choice” Awards in the Gallery of Excellence at the 2013 Glass Craft & Bead Expo, the annual premier US glass show in Las Vegas. 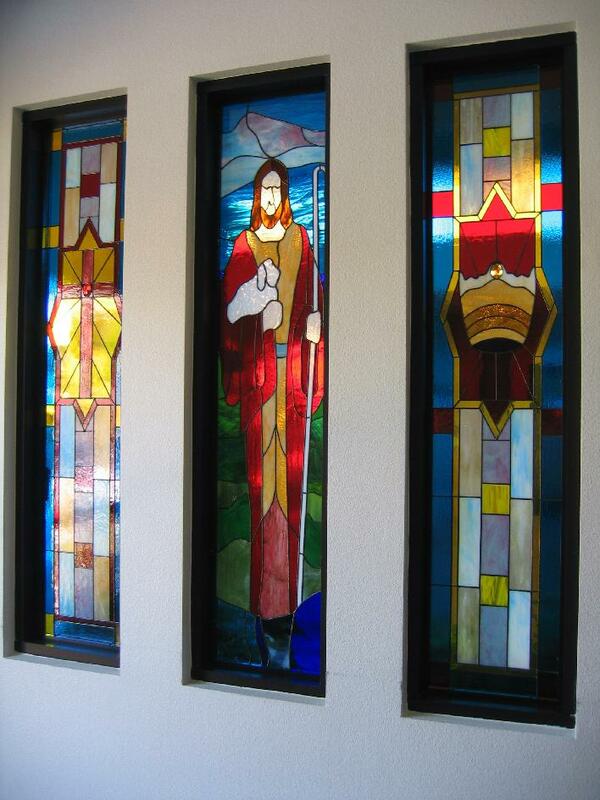 The Fifth Grade Class of 2008 wanted to leave these stained glass windows as legacy to the Faith Community Lutheran Academy in Las Vegas, Nevada. 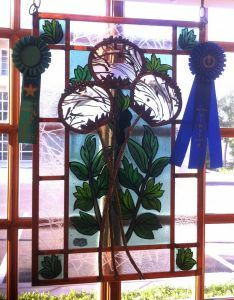 Each stained glass panel is five feet tall x 14″ wide. I was honored to be able to be apart of leaving such a gift for future generations to view as symbol of their faith. 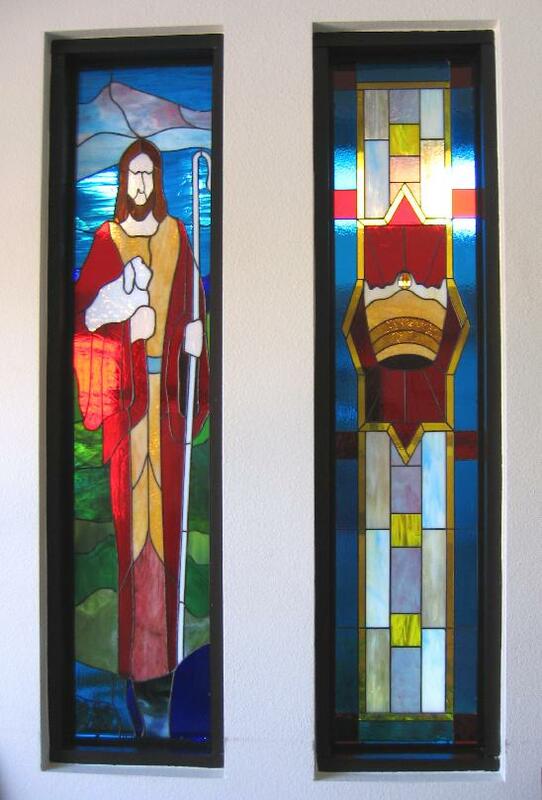 The stained glass panels of the “Cross”, the “Shepherd” and “Crown” were installed before the last day of class, June 2008.